Xi cites Karl Marx when he explains that the totality of relations of social production "constitute the economic structure of society, the real foundation, on which arises the legal and political superstructure and to which correspond definite forms of social consciousness." Reforms should be seen as an integrated whole designed to "establish a socialist market economy." Xi argues that the market-government balance remains in an unstable equilibrium and that the market should play "a decisive role" that will enable the government to more effectively carry out its role. As China's economy rapidly progresses, this simultaneously exacerbates inequality and "people's awareness of equality, democracy, rights and interests" also grows, "hence people's sense of injustice becomes more pronounced." So the Party must make social fairness, justice and the well-being of the masses the "starting point and ultimate goal." 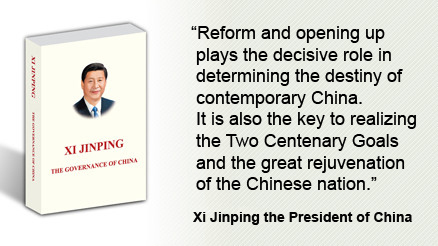 Reform, Xi says, will lose its meaning and cannot be sustained "if we cause more inequality". Whilst material development necessitates that some people will get rich before others, the Party can and must ensure that as the cake gets cut fairly as it gets bigger. This must start with ensuring access to education, well-paid work, healthcare, old age care and housing. All this requires the popular support of the masses, the "creators of history." In order to remain at the helm of China's transformation, the Party must implement the mass line by working as one with the masses, sharing their "weal and woe." This focus on the expectations, needs and interests of the masses must be combined with the mobilization of their participation, enthusiasm, initiative, creativity, wisdom and strength to make 1.3 billion people into a unified force moving towards socialism. President Xi Jinping focuses on making social fairness, justice and the well-being of the masses the "starting point and ultimate goal" of reform.